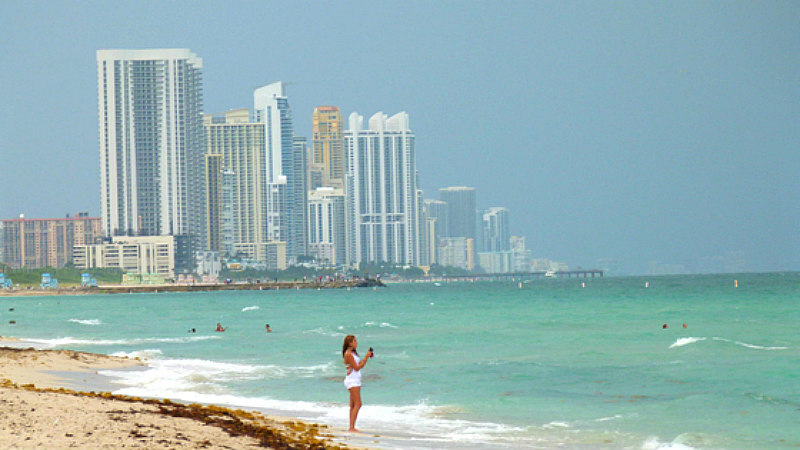 So you’ve always been curious to see Miami, but you aren’t sure if Miami Beach with kids is such a great idea. Take heart, friend, because I just visited with the hubs and one kid in tow and was delightfully surprised at how much I loved it. This is part two in our Florida Beaches series, so if you missed it, check out the top 7 things to do in West Palm Beach. Let’s dive into (see what I did there) how and why to take a peek at Miami Beach with the family, shall we?! 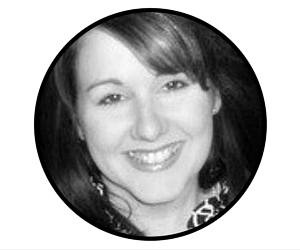 1. to look quickly, typically in a furtive manner. I use the word peek because that’s all our family had time for. 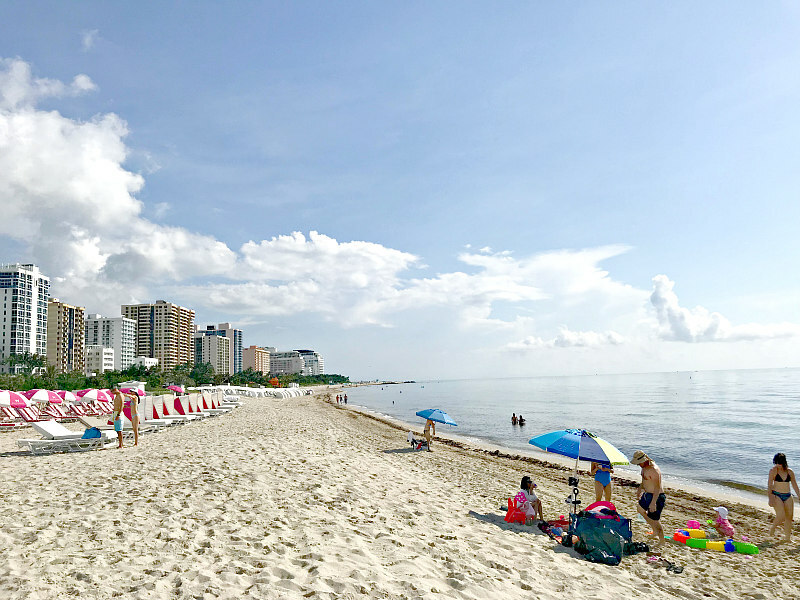 As part of our Florida road trip to compare beaches along the east coast, the plan was to leave West Palm Beach bright and early to arrive in Miami, Florida mid-morning. We wanted to spend just enough time to scope out the downtown and beach scene before heading to the Florida Keys. Miami Beach, especially South Beach, has quite a reputation of being a party spot for the rich and barely dressed. Since my youngest is a teenager, we knew it would be fine. Even with the worse case scenario… we’d leave if things weren’t cool. The funny thing is that we didn’t see anything risque whatsoever. Zero. Zilch. Not even a skimpy swimsuit. My disclaimer is this: I’m not sure what it’s like other times but we ended up there on a Sunday morning. People were laying in the sun and playing in the water like they do on any other beach. But it the sand and ocean colors were clear and gorgeous! Parking is at a premium in Miami Beach with many cars and people walking the sidewalks. After seeing all of the choices, the place we believe is the best place to park is a parking lot adjacent to the Hilton Cabana Miami Beach Hotel. There were many parking spaces with parking meters. I’ll include the address at the end that can be used for a GPS reference if you want to retrace our steps. What is wonderful about this parking spot is that it was a gorgeous area with super close beach access and what looked like a park nearby. I loved how everything was so stinking clean and how there were so many pedestrians and joggers in the area. We walked down to the ocean through the fluffy, white-ish sand and noticed the Caribbean blue color and clarity of the water. There were rows and rows of lounge chairs and umbrellas for rent and a fair amount of people to be so early in the day. Just like most beach towns, the roads parallel and closest to the beach are where the action’s at. My jaw literally dropped when I saw the upscale but retro, Art Deco Historic District. It was so lovely. 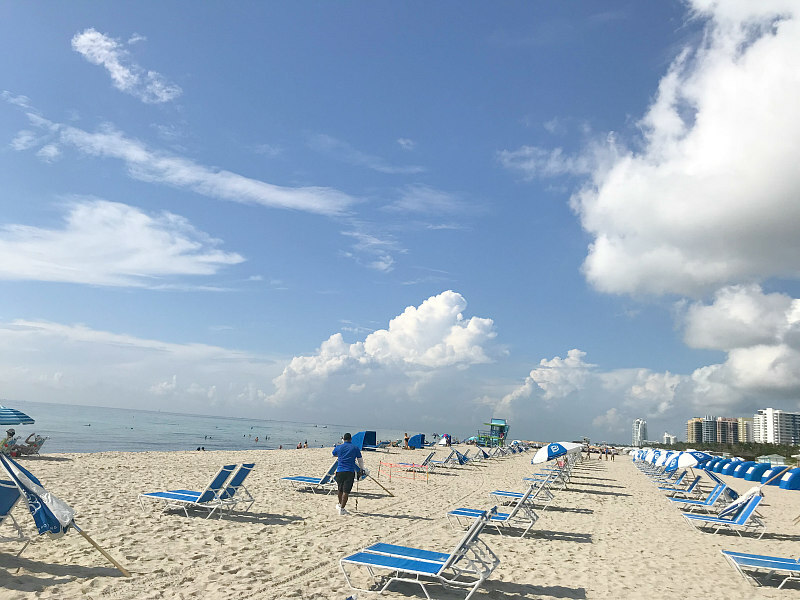 We spent most of our time cruising Collins Avenue, Ocean Blvd, and 14th Avenue (along the beach) before parking near the Hilton Cabana Hotel. On our way back from the beach to the parking area I mentioned, I talked my crew into taking a peek inside the ultra-glamorous Hilton Cabana Hotel. Wow, it was unbelievably art deco, yet modern at the same time. The only problem with taking a gander inside is that my girl is now asking me if we can return and stay there a few nights. Near this beach access area, you’ll find an assortment of restaurants of all types. The Tavern is a traditional breakfast and brunch joint with indoor and outdoor patio seating. New York Bagel Deli is a great place to grab an espresso, iced coffee, fresh bagels, or sandwich and head to the beach. New Camp Argentino is a steakhouse restaurant with a menu consisting of pasta, pizza as well as traditional Argentinian food. Before you leave town, you must check out Flamingo Park, a 36-acre park built in the 1950s that’s been renovated to perfection. Don’t miss the aquatic center’s 8-lane lap pool and a zero-depth entry water play area, the climbing wall, and the dog park. So as you can see, we had a nice little Miami Beach with kids day without incident. I definitely recommend a stop! Don’t miss the fun video of our adventures in Miami below. 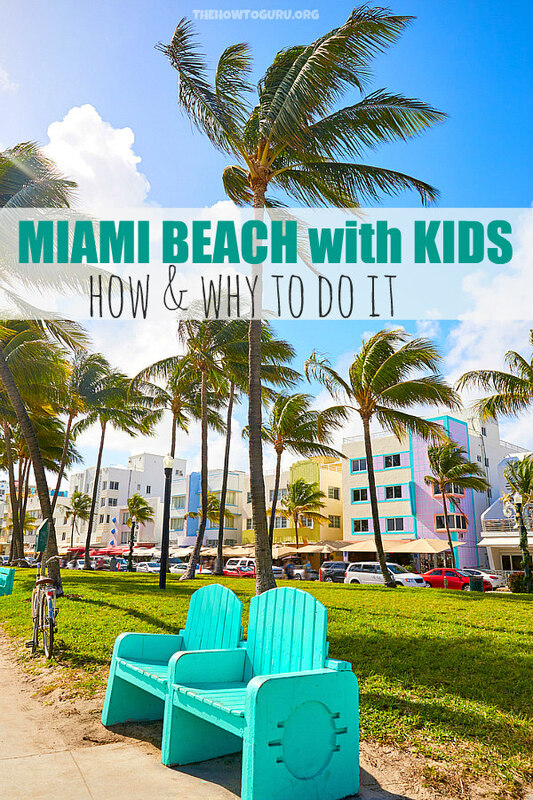 When do YOU want to visit Miami Beach with Kids? I’d love to hear about it in the comments! I’ve been to Key West but never Miami. You are compelling me to take my family there! The beaches looks amazing! Yay. It was a gorgeous beach! That happens to me. When I take my kids to see a neat place, they want to come back and stay there. It’s usually the $500 a night hotel. I too would have thought that we could not visit Miami Beach with kids. Glad to know that there are times that it would be okay. Sounds a fun time can be had. It is so beautiful! I loved West Palm when I visited but I was sad I didn’t get to see Miami Beach. Now I am really bummed I used the Art Deco district, that would’ve been my favorite. It sounds like Miami would be a great getaway even with the family. The art deco had me in heaven. It was so cool! Thanks for the run down on Miami! My mom lives there so now when we go visit her we will have a nice list of things to see and do! Oh, Wow, that’s awesome, Liz. Yay!